Remember how I said in my last "Acquisition #123" post that I recently picked up Pilotwings Resort (via Best Buy) for a song? 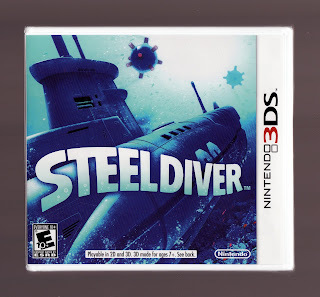 Well, I picked up another first-party, launch-window 3DS release, Steel Diver, at the same time and for the same price--that being $4.99. Sadly, Steel Diver has yet to experience the inside of my 3DS (that sounds dirtier to me than it should), so I can't tell you what I think of it in this post. I promise to give it a go sooner rather than later, though, and then bore you all with my impressions. I haven't kept it in its shrink wrap because I'm uninterested in its content, mind you. Actually, I'm really quite curious about it, as I don't believe I've ever played a game focused on piloting a submarine. Have any of you taken Steel Diver for a spin? If so, did you enjoy it, hate it or feel something in-between for it? I'm a huge fan of this game. It is one of my favorite 3DS games. $4.99?! I think I need to take a trip to Best Buy. Well, at least I know someone may sell it that cheap!